When I first set up my palette, many years ago, I used a book by Hilary Page - Guide to Watercolor Paints (see Amazon info). This book has information on each pigment and the brands that make them. It lists five factors: quality, reliability, lightfastness, handling characteristics and mixing potential for each of the paints. These can all be very important factors, especially lightfastness, when choosing your paints. 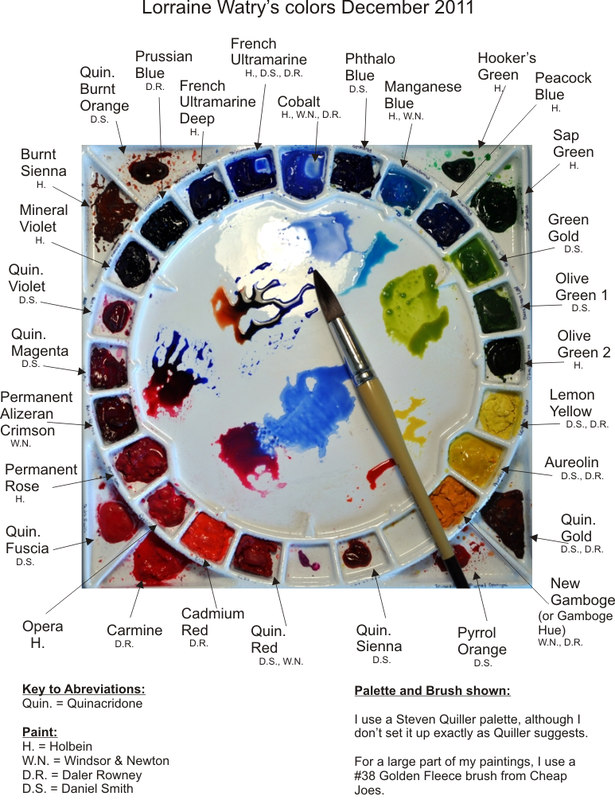 I use a Stephen Quiller palette (see ASWexpress store). They come in plastic and porcelain and small (for travel) and large (for the studio). I like the large center well for mixing and the ability to set the paints up like a color wheel. I don't have my paints exactly as Mr. Quiller suggests, but it works for me. The brush that is pictured is the main brush that I use for most of my painting. It is a Golden Fleece Brush from Cheap Joes (see Cheap Joes store) and is a size #38. I have really liked this brush; it has a nice point for small areas and holds a lot of paint and water. This is not the only brush I use, but it is my favorite!